A sturdy pair of kitchen shears with tapered and fine tips is good for a wide range of kitchen tasks. The best pair has roomy handles suitable for piercing fish fillets or cutting through chicken joints. Other than this, you'll realize that there are thousand things to do with kitchen shears once you have them. In essence, they are multipurpose in nature and design. This is an essential tools without which you cannot peel off the outer parts of vegetables such as carrots and potatoes. It consists of a slotted metal blade attached to a handle. When you are choosing the best on the market, we recommend a peeler that has a perfect grip. The blade opening should at least be 3 inches in width. A Dutch oven made of cast iron coated with enamel is perfectly designed for slow braising. Or indeed, anything that requires low and slow transfer of heat is suitable for Dutch oven including soups. Most significantly, the thick walls together with the heavy lid ensure minimum evaporation while bringing out juicer and tender meat. Mixing bowls are made of different types of materials such as glass and metal. Their main function is to mix up ingredients prior to the actual cooking. Although they can serve additional functions, this is their primary function. Whether you want to choose ceramic, plastic or glass, it all depends upon your choice and preference. Knives are multipurpose kitchen tools whose functions are varied and unpredictable. Examples are chef’s knife, paring knife and serrated knife. With these knives in place, be sure to use each one of them rightfully. The pointed tip of a paring knife is designed to get into tight spaces that cannot be pierced by chef’s knife. Usually, chef’s knife is bigger than paring knife. Flexible cutting boards allow you to cut your ingredients into your desired size then scrap them directly into your cooking pot. Kitchen cutting boards are made of varied materials such as plastic and wood. Furthermore, they come in different sizes suitable for different user categories. Basically, your choice of the size and material depends on your individual desires. A whisk is essential equipment when it comes to blending ingredients smooth or incorporating air into a food mixture. Particularly, it is effective at smoothening uneven liquid mixture. If you are going to make pan cupcakes or fry eggs, you need this tool. In design it consists of thin narrow looped and joined at the end. For the purposes of efficiency, choose the one with a narrow solid handle rather than the one with a wired handle. A complete set of measuring equipment is largely responsible for accuracy in your BBQ. With attention to the markings on the measuring cups, you are absolutely sure of exact quantities. This gives you the rightful flavor of the food you are cooking. Conversely, approximation of quantities might one day cost you, especially if you have visitors coming around. Thanks to the magnetized handles of these measuring equipment. They keep them intact and pulling apart doesn’t apparently require much effort. It is necessary for frying, browning or searing food. Typically, skillet is a flat-bottomed equipment measuring 200 to 300 mm in diameter with a long handle and relatively low sides flaring outwards. Even though they come with no lid, their design suits exactly what they are designed for. Skillets also exist in a variety of materials such as stainless steel and aluminum. If you are an enthusiast in the area of baking, you definitely are going to require a loaf pan. It is great for making pound cakes and meatloaf. In like manner, if you want to try out a hand in making simple yeasted loaves, a loaf pan is greatly significant in your journey. In terms of design, the best ones are made of aluminized steel. Henceforth, it is long-lasting, non-sick and rust-resistant. Ideally, you’d expect to simply set your desired grilling temperature by simply pressing buttons and waiting. However, the situation in many home ovens and what turns out is that you will constantly be disturbed checking temperature. Having an oven thermometer is the ultimate solution to your BBQ needs. Once you have your oven thermometer, ensure you stick to the manufacturer’s instruction. Wooden utensils range from wooden spatula to wooden spoon including many other equipment therein. Ultimately, these are the multi-taskers and friends and friends of any cook. For instance, a good wooden spoon is suitable for soup testing, sauce starring or making a creamy risotto. In a word, having a set of wooden kitchen equipment would do well to your kitchen and BBQ well being. Washing and removing excess water from your salad greens is no hassle as long as you have a salad spinner. Scientifically noting, it is designed to use centrifugal force to separate water from the moist leafy contents. This way, salad dressing sticks to the leaves without getting diluted. Moreover, when it comes to serving of the serving of salad, a salad spinner is still your best companion. Tongs are not tongs unless they are sturdy enough to serve the function for which they are intended. Tongs that are perfect functions in an exact way your fingers act. Notably, the best way of grabbing the tender spring asparagus stalks or bone-in pork roast is by the aid of the tongs. It’s also worth-noting that weaker tongs would break considering their multipurpose nature. A box grater is a significant solution to all the hassles of using a microplane. You can use a microplane to create a fine shower of lemon zest or parmesan. Using a box grater, you can perfectly shred two pounds of cheese to make classic baked mac. In other words, a box grater is a perfect improvement of a microplane. What makes it suitable for its function is the upright position and larger holes. Kitchen tools are as numerous as there are opportunities for creativity in grilling and smoking. Although mastering and having all of them as required may be challenging, what you grill on regular basis is your guide. For instance, there is a difference in the tools required by those who bake regularly compared to those who regularly smoke meat. The above described tools are the most essential you should never miss out, and you can add others on the list. In the light of your grilling and smoking needs, you will ultimately equip your kitchen with basic necessities. 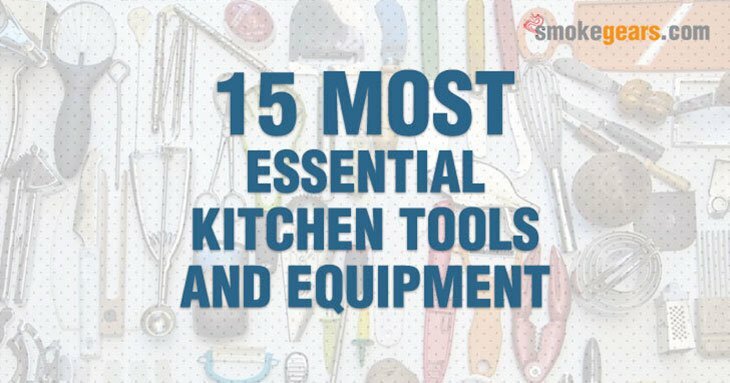 The best way to ensure certainty is by developing a checklist of tools and equipment from our list. As you check through, tick one by one to identify what still misses as far as your needs are concerned.